Craft brewers draw inspiration from all sorts of unlikely culinary domains. For the nautical set, there’s oyster beers, and for stoners, there’s certainly weed-infused libations that promise a similar effect as edibles. This is to say nothing of beer made from severed bull testicles. 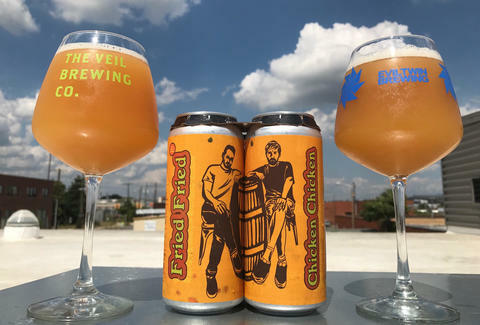 But the hedonists over at the Virginia-based Veil Brewing Co. had a different plan in mind when they conceived of their latest beer-experiment: a beer made with the tender love of fried chicken. 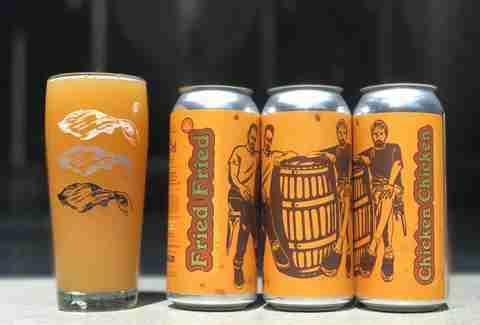 A collaboration with Evil Twin Brewing, Fried Fried Chicken Chicken isn’t necessarily going to transport you to Waffle House, although it does pack a formidable amount of hoppy booze. It’s a Double IPA that registers at 8% ABV, brimming with all sorts of aromatic goodness and notes of citrus and pine. Veil Brewing Co. debuted Fried Fried Chicken Chicken on Tuesday at its Richmond brewery and taphouse. The brew is available for a limited run in 16-ounce cans. A four pack costs $18.50 -- which is still quite a lot more than a dozen organic eggs because, hey, this is hifalutin craft beer we’re discussing. So far, the beer is only available in Richmond, Virginia. Fried Fried Chicken Chicken was apparently inspired by Evil Twin founder Jeppe Jarnit-Bjergsø’s first trip to Cracker Barrel. The Danish beer entrepreneur was reportedly smitten enough with the fried chicken Americana that he devised a way to marry it with craft beer. For those of you expecting a gristly taste reminiscent of an actual Chick-Fil-A sandwich, you might be slightly disappointed to learn that chicken comprised a very small proportion of the actual beer: Just .4% of the mash was whipped up using fried chicken, and the company sadly claims the beer does not taste like a delicious deep-fried chicken strip. Nonetheless, it’s probably the only poultry product you can get away with gulping at a party.